El-Hadj Diouf has had time to get used to the bad-boy image he will undoubtedly be handed after allegedly spitting at a group of Celtic fans. Last night's incident is just the latest in a string of controversial moments in Diouf's young career. 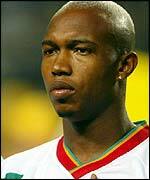 Diouf's first professional club, French side Sochaux, quickly tired of the talented but boisterous Senegalese teenager, and he was sent packing to Rennes after a succession of minor transgressions. Rennes was meant to be a fresh start, and Diouf settled in quickly, forming friendships with the likes of David Sommeil, now at Manchester City, and Arsenal's Sylvain Wiltord. However, a car crash came close to bringing Diouf's career to an abrupt halt. Diouf, who was driving without a licence, smashed into another vehicle, injuring a woman passenger in the process. Taking into account his age and evident remorse, the French courts decided Diouf would face community service rather than prison. 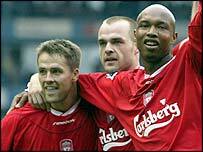 "I was young and immature then," Diouf has said. "I learnt from my mistakes." West Ham fans might disagree: they alleged Diouf spat in their direction earlier this season. That accusation was investigated by the police but subsequently discarded. There is no certainty that Scottish police, who will investigate Diouf's altercation with the Celtic fans, will come to the same conclusion. With such a record sheet, one might easily believe that the Senegalese star, the current African footballer of the year, is something of a hothead. There is a degree of truth in that, but it doesn't tell the whole story. Diouf, who is only 22, is an engaging character who amuses and infuriates in equal measure. Many who know him say that he does not have a bad bone in his body. Nevertheless, he has an impetuous streak which frequently lands him in trouble. When the Senegal team meets up, Diouf is invariably the life and soul of the party: a provocative joker who likes nothing better than winding up his team-mates. One particular favourite is his after-training routine, in which he marks each player's performance out of 10, never failing to give himself the maximum score. It is all done with tongue firmly lodged in cheek and a smile on his face, and the peroxide blonde is loved by his fellow internationals. It is, however, a judgment Celtic fans are unlikely to share.